Next Meeting: Monday 16th November 7.30pm – please come along and offer your support & help! Cakes & 'Heavies': Fr Christopher has the lists. Draw Tickets: are available, please take some home; sell them to friends and family and then return the counterfoils and money – in a sealed envelope as soon as possible! Bottle Stall: Please bring in bottles of wine, spirits and soft drinks. This wonderful stall is always popular and helps the atmosphere and the takings of the Bazaar as a whole. How about donating your ‘Buy-One-Get-One-Free’ offers that you may be getting with your supermarket shop! Please bring in: Good-as-new toys, Jewellery, DVD’s, fancy goods, Religious articles, your handmade crafts and jams. Only bring items which are new or almost-new (no dumping!). No electrical items please! Comunidad Latinamericano sábado 21 de noviembre. Por favor entregue forma con su orden y el dinero exacto lo mas pronto posible. Bistro Menus: are available now - pick yours up today. Dinner places can be booked with Fr CB. To find out how it all works and how you can join in, please watch the presentation below. www.stbedesc.easysearch.org.uk - As well as shopping you can also earn free donations by using Easysearch - it uses the Yahoo search engine, and for every 2 searches, we will receive 1p. If you shop using a mobile or tablet - there is an app for that! Join: Head to easyfundraising.org.uk/causes/stbedesc and sign up for free. Shop: Every time you shop online, go to easyfundraising first, pick the retailer you want & start shopping. Raise: After you've checked out, that retailer will make a donation to your good cause for no extra cost whatsoever! Please help us this Christmas by giving more than a gift - there are no catches or hidden charges & St Bede’s will be really grateful for your donations. Thank you for your support. Welcome back to Fr Andrew: who is in England accompanying His Eminence Raymond Leo Cardinal Burke who is doing Confirmations this weekend (Jenny Adonai from here) and the annual requiem at Westminster Cathedral. This is to mark the 50th anniversary of the Latin Mass Society. Today at 2pm he will preside over the CIEL conference at Brompton Oratory. All are welcome. Readers for Sunday 6pm Mass: We need two more readers for the Sunday evening Mass (the new rota will be available from next weekend). Please write your contact details down clearly and leave at the Presbytery. First Communion: In September we had the enrolment (we have 33 for 2016) the books have all been distributed and soon we will have a Mass with a session afterwards to see how you have progressed with the books (parents & children are to work together on these workbooks and lay the groundwork for the next stage of preparation. Please put your name in the book!) We have run out of texts and there are one or two enrolled which still have not got a book - make yourselves known! The textbook we use is published in the Philippines and has an English & Spanish edition which makes it ideal for our parish here. APF Red Boxes: Don’t forget you can drop your Red boxes in at any weekend Mass if it is full. We will empty it and return to you ASAP – please make sure your name and address is written on the label at the bottom so we know who you are! Church Cleaners - 20th & 21st November: Angelo Ilo, Teresa Ablett and Rita Ajuga. Please note: Saturday at 10am we have a Requiem. Welcome to God's Church: Alexander Juan Broomfield, son of Anthony & Josephine baptised at the end of October and Felix William Arden Brown, son of Adam & Olivia baptised last weekend by Fr Christopher. Adam is a former parishioner who Fr Chris married in East Anglia a couple of years ago. 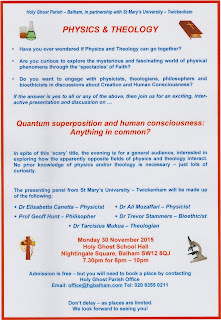 Physics & Theology Brain-Teaser: Holy Ghost Parish - Balham, in partnership with St Mary’s University - Twickenham, is hosting a presentation and discussion with 5 academics from St Mary’s on how physics and theology interact. 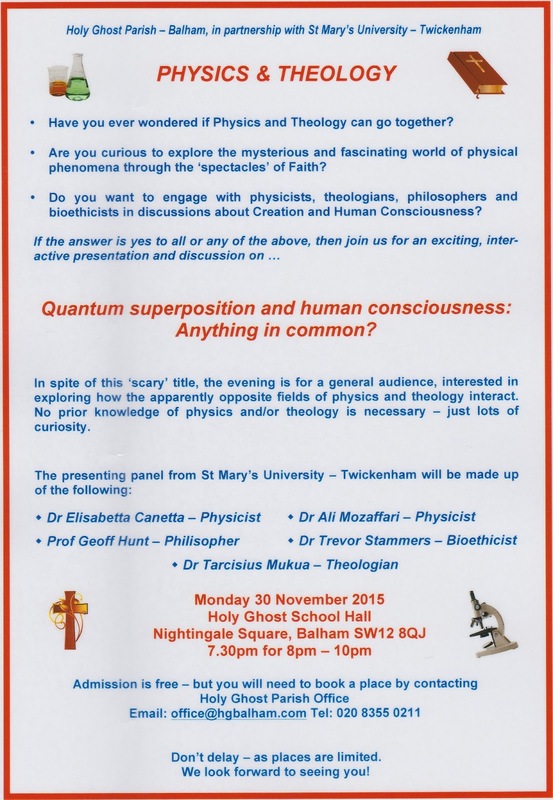 The event will take place at Holy Ghost School - Nightingale Square - Balham SW12 8QJ on Monday 30 November 2015 - 7.30pm for 8pm until 10pm. Admission is free, but places are limited, so you will need to book through Holy Ghost Parish Office - email: office@hgbalham.com tel: 020 8355 0211. There is a poster with further details on the Church Noticeboard.